I’m very excited–Dear Dracula, a 48-page hardcover children’s book, published by Image Comics, and created by my dear friends, Josh and Vinny, will be available for purchase this Wednesday (October 15, 2008)! If you can’t find it at your local comic book shop or book store, you might try Amazon.com. 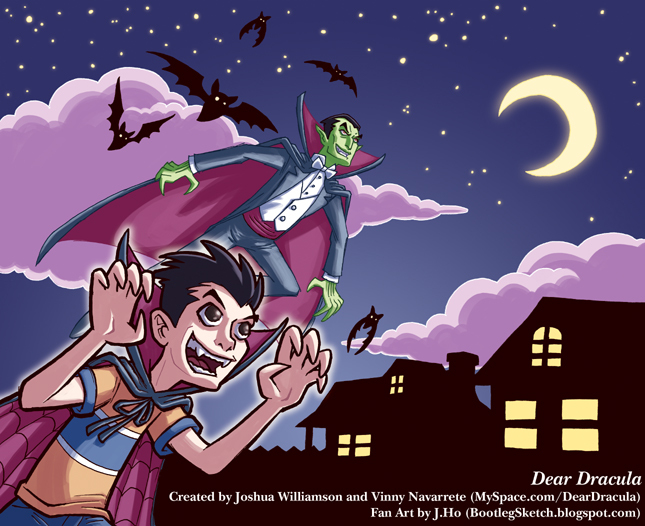 The book tells the story of a funny kid named Sam, who’s obsessed with Dracula, and decides to write him a letter–honestly folks, a fantastic all-ages book, especially for the Halloween season. I promised something more substantial today, and I delivered, right? I mean, come on, background, multiple characters, what more could you ask for? A better composition you say? Yeah, okay, this composition is a little weird. Bah, forget my fan art, just go buy the real thing. Seriously. Thank you for the reminder! I’ll pick one up (or order it, knowing my lazy self). I just have to remember to bring it to SDCC next year for autographs!